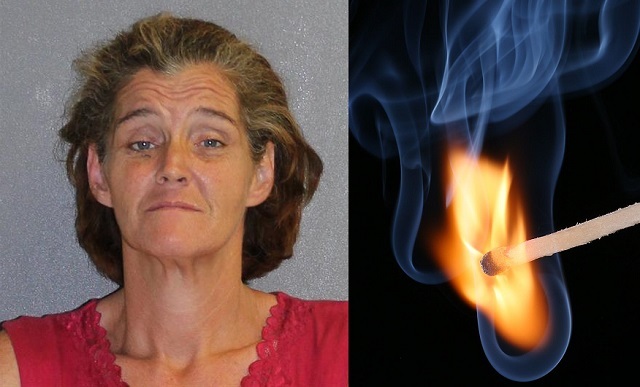 DELAND, Florida - A Florida woman is in the Volusia County Jail after deputies say she doused her boyfriend's shorts with an accelerant and then set him on fire because she was mad at him for not providing her with drugs. The incident occurred in a homeless camp in the woods off of North Woodland Boulevard north of DeLand, Florida. The Sheriff’s Office was initially alerted to the situation shortly after 4 p.m. by someone who said that a woman had asked her to call 911 because her boyfriend got burned while they were trying to start a fire. The woman then pedaled off on a bicycle. Several minutes later, while a Sheriff’s Office dispatcher was still talking to the caller, she reported hearing faint screaming sounds coming from the woods. Moments later, the caller said there was a naked man in the middle of the road arguing with a woman. Around the same time, the Sheriff’s Office received two other calls from witnesses who reported seeing a naked man on the side of North Woodland Boulevard. One caller said he was yelling for help, and the other said he appeared to be writing in pain. Paramedics were first on the scene and started treating the 34-year-old homeless man and preparing him for an ambulance transport to Halifax Health Medical Center in Daytona Beach, Florida before deputies arrived. Once Sheriff’s deputies arrived, they were told that this was no accident. Despite his injuries, the victim was able to tell deputies that 41-year-old Annie Harper had poured lighter fluid on him and then set him on fire. The boyfriend, who suffered burns over about half of his body, was stabilized at Halifax Health Medical Center and then transferred to Orlando Regional Medical Center’s burn unit. Responding deputies spotted the girlfriend’s bicycle at a nearby convenience store and then quickly located her and took her into custody. Harper claimed that her boyfriend set himself on fire after he argued with her. Deputies, however, noted that Harper exhibited signs of deception during questioning and gave several different accounts of the events. At the conclusion of the investigation, deputies arrested Harper and charged her with aggravated battery. They also added a second misdemeanor battery charge after a witness reported seeing Harper kick the victim as he was lying on the ground.